Sorry for the hiatus, life is been hectic, been settling things with the family and work consumes most of my time. Not only my full time but also I am developing a fashion line (so stay tuned). Once I thought I wouldn't blog in a long time as I don't feel like sharing and blogging has its own mood but i miss it too much. I shot this after my meeting with Google Asia team, oh and yes that blue is similar to their logo if you notice hahah. Life is been pretty much mobile lately so comfortable and proper ensemble is essential to me, as well as mini carry all to accommodate all meeting needs. For me black tee or tank top is always been a great staple, and this T by Alexander Wang number is no exception. I love its relaxed fit and cool materials, great to be worn in any occasion - even to be paired with my work blazer. See similar piece here, or here. or get the classic slub top if you prefer here. 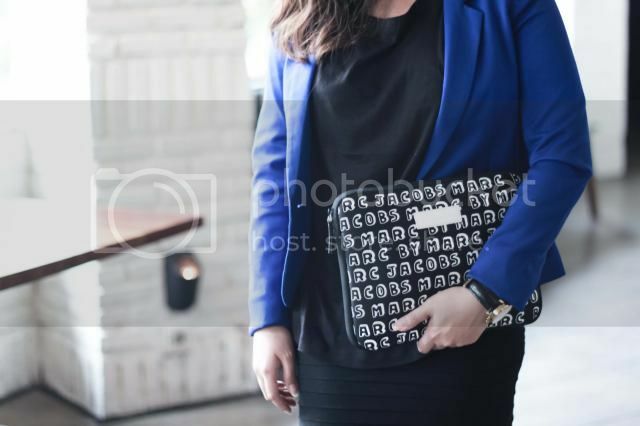 Loving this Dreamy logo neoprene iPad pouch from Marc by Marc Jacobs. I'm a big fan of black and white and it also applies to my accessories. It fits my iPad, note, stationery, just perfectly I can carry it to most of my outside meeting. If you want a more colourful one, you can pick this one here. I also feel like getting one for my Mac as seen here or this one with handle. really love your ipad pouch! loving this working look, so chic! Love that blue blazer dear. Smart-look! What a stunning look! I really adore this look from head to toe! Nice jacket! and you look so cute!